On Sept. 6, Jess and Georgette Sanchez, parents of missing Los Gatos resident Jeanine Sanchez Harms, made a rare public appearance at a press conference held in town. 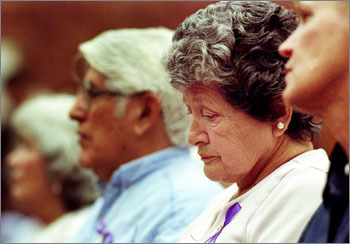 Georgette Sanchez, sitting beside Jess (left), is overcome by emotion as Los Gatos-Monte Sereno Sgt. Kerry Harris gives update statements on the case. "We have not slacked on our resource and manpower allocation on this case," Harris said. "This is still a priority with us; I know it is with you." The Los Gatos-Monte Sereno Police Department and the Carole Sund/Carrington Memorial Reward Foundation held the conference to announce the foundation's donation of $5,000 to Harms' reward fund. The Modesto-based foundation was formed after the murders of Carole and Juli Sund and Silvina Pelosso in Yosemite in 1999. On Sept. 19, a dinner will be held at Britannia Arms on Almaden Expressway in San Jose from 6 to 8 p.m. Unlike past dinners for Harms, this event will not be a fundraiser; the family's intention is to keep up the awareness level of Harms' disappearance.